Lebanon, Indiana – July 23, 2018 – There is no substitute for hard work, plain and simple, that describes Michael Burnett of Burnett Farm in Lebanon, Indiana. Burnett is putting in the sweat equity to be a top grand prix rider with a successful business. 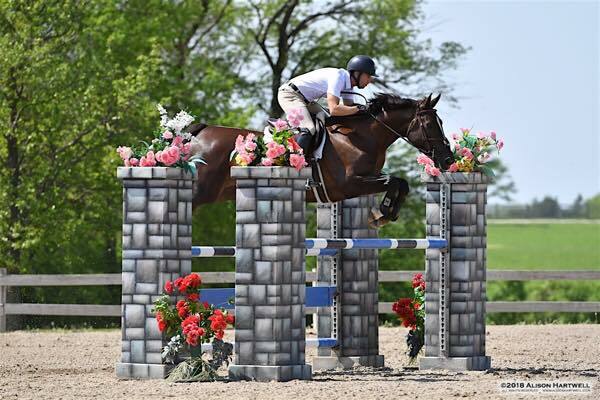 Known as a fierce competitor, an excellent rider with International experience and a man of integrity, he’s successfully managing riding goals, sale horses and investment horses while showing in the Midwest and Wellington, Florida. 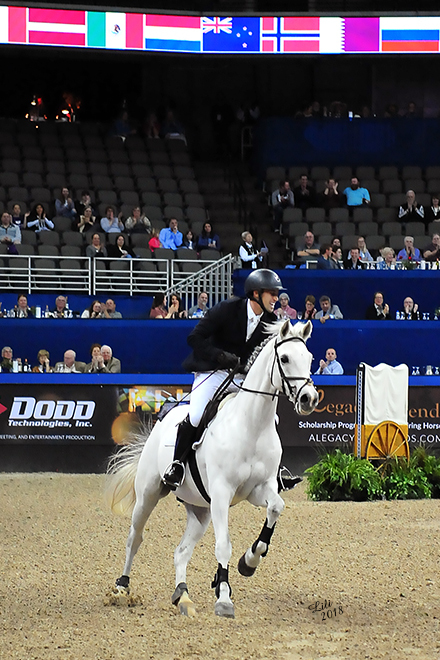 Burnett, 26, has his sights set on the big picture and top grand prix competition. He's off to a good start with his own mounts, Iron and C-Max, adding to his resume this season; six jumper class wins up to 1.40m at the 2018 Winter Equestrian Festival, 2nd in the $100,000 InIt2WinIt Speed Series Finals at the Omaha International Horse Show, 2nd in the $25,000 Grand Prix at Maffitt Lake and 3rd in $20,000 Midstates Grand Prix. 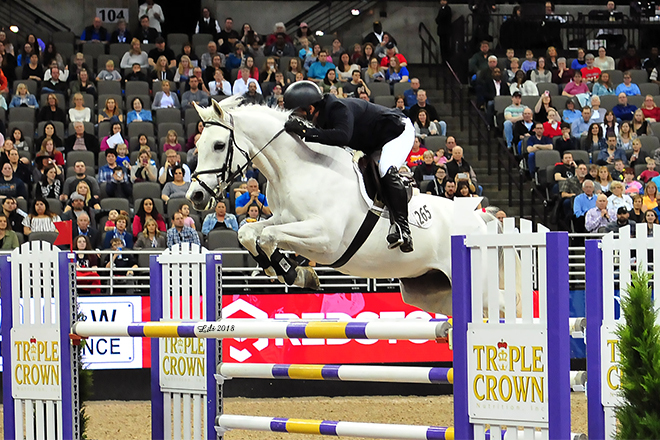 In May, Burnett won the SmartPak Jumper Classic at Balmoral Park in Chicago. He’s taking sale horses to the ring and walking back to the barn with top placings, which include Champion in the 1.25m at the World Equestrian Center with Casal I, Champion in the 1.25m at Maffitt Lake with Conpardie Z, Champion 1.30m at Balmoral with Conpardie Z and Reserve Champion in the Farmvet 1.20m Jumpers on Clinto VH Dingenshof Z at Showplace Summer. “I see hard work as a tool that I choose to use to help me reach my goals, just like education is a tool. You have to put in the work to make things happen,” said Burnett. Michael Burnett with Genevieve Munson on Conpardie Z in the winner's circle for the Low Junior Jumpers at Balmoral Park. With Genevieve Munson of Rogers, Arkansas, aboard his sale horse Conpardie Z, the team won the Low Junior/Amateur Classic and one of the division classes at the Showplace Summer Show at Balmoral Park. Conpardie Z is currently in second place in the USEF National rankings in the Low Junior Jumper division. Burnett is working his way up and is always looking for good horses and sponsors to join his team and is willing to put in the work necessary to get to the top. He’s working on a trip to Spruce Meadows in 2019, which will be his second time competing at the prestigious horse show. Burnett welcomes new clients to join Burnett Farms and encourages them to team up and experience the exceptional quality training he provides to both horse and rider. At the end of July, Burnett will head to Kalispell, Montana for the special event, Two-Masters - An Evening with Buck Brannaman and George Morris, Friday, July 27th at 5:00pm at the Majestic Valley Arena Pavilion. Both masters will conduct clinic sessions and join together for a round table discussion on classic horsemanship. Click here for more information. Watch the Burnett Farms Facebook page for exciting and upcoming clinics to be held at Burnett Farm. Now accepting serious clients, investors, sponsors and horses in training for Wellington and Spruce Meadows 2019.